Steve Jobs just left the WWDC ’10 stage in San Francisco after having showed us the new iPhone, iPhone 4, and iPhone OS 4 which has now been renamed to iOS 4. 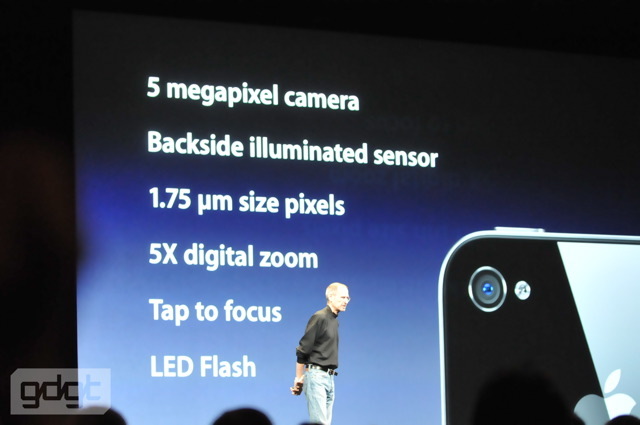 Most of the iPhone 4 things we already knew thanks to the whole “I lost my iPhone in a bar”-story. 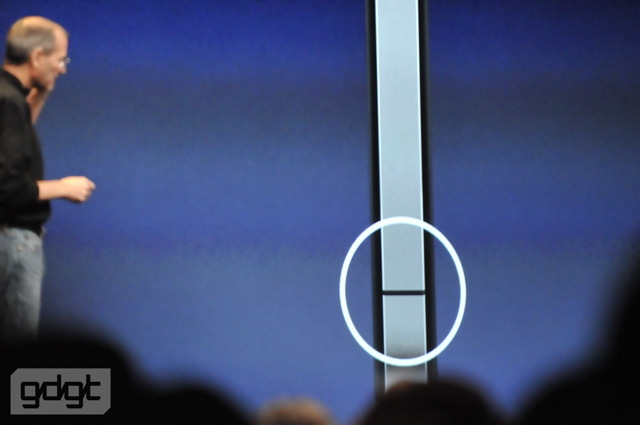 Some questions were raised about the physical design of the iPhone though, as to why it appeared to have lines in the steel. Well, they’re supposed to be there and there are three of them. They are part of the structure of the iPhone as stainless steel are used as part of the antenna system. It’s got integrated antennas right in the structure of the phone – that’s never been done before. Also, glass on the front and back. 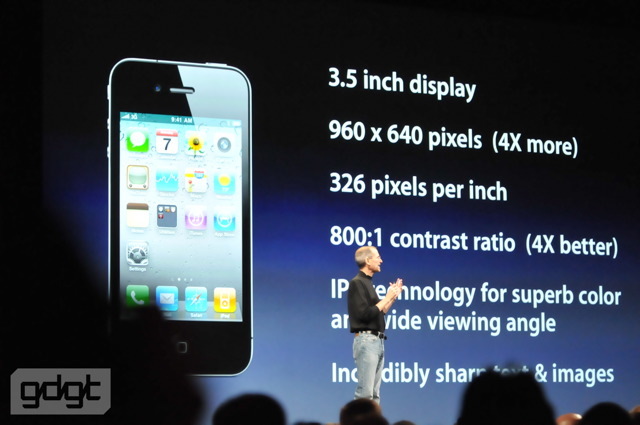 Besides that, the iPhone still has a 3.5″ display but with 960×640 pixels resolution, 4x more as iPhone 3Gs, coming out at 326 pixels per inch (which is really, really good) and 800:1 contrast ratio (4x better). It’s not OLED display since they cannot be made with this kind of resolution. 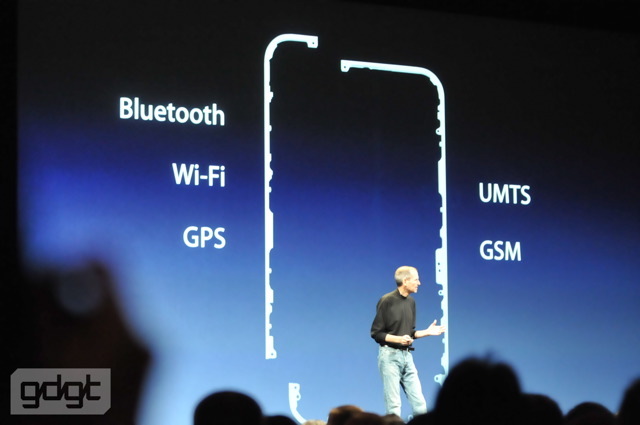 A gyroscope has also been built-in to the iPhone which joins the four other sensors. iPhone is now more intelligent about the world around you. As for the camera, it’s now 5 megapixel with a backside illuminated sensor for better low-light performance and LED light as flash. 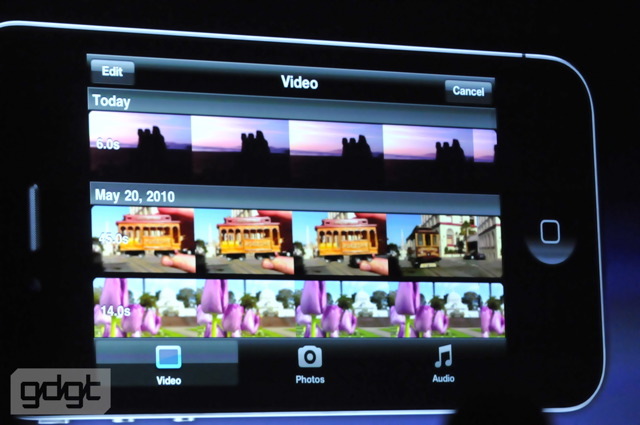 It’s also capable of HD video recording (720p, 30fps) and – here’s the kicker – you can edit your HD video directly on the video, including transitions and brining in music from iTunes and geolcation to titles. Must be a pretty powerful A4 processor in the new iPhone. As expected, iBooks is now also on the iPhone (with iOS 4). 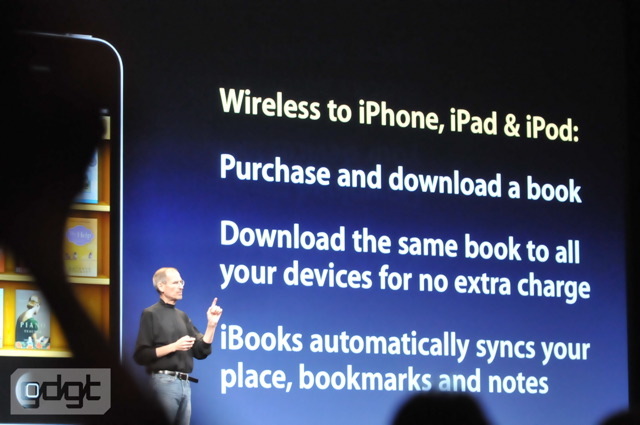 Books you purchase in iBooks will be available on all your iOS devices (iPhone, iPad, iPod Touch). And the most important part (for some) – iPhone 4 launches in five countries on June 24th: United States, France, Germany, United Kingdom and Japan. Pre-orders start June 15th. In July, iPhone 4 will be available in 18 more countries: Australia, Austria, Belgium, Canada, Denmark, Finland, Hong Kong, Ireland, Italy, Luxembourg, Netherlands, Norway, New Zealand, Singapore, South korea, Spain, Sweden and Switzerland. In August, 24 more countries will be added and in September they’ll add 44 more, making it a total of 88 countries. No information yet if Malta will get it in August or September (probably September, I’m afraid). iPhone 4 comes in two colors, black and white. Price is $199 in the US for the 16gb model and $299 for the 32GB. iOS 4 will be free and available June 21st – they finally found a way to make it free for iPod Touch users as well. I watched the WWDC on live stream and was disappointed there was no word on a Verizon iPhone. Nice WP theme by the way. How did you get your logo in the header? Does this theme support custom headers? Thanks, it’s the Thesis theme – a great SEO optimized theme. Yes you can put your own graphics/header into the top of the theme. I found another site that uses this theme and looks really good. I want to use this or a similar theme for a non-blog site. Does anyone know the protocol for using WP themes for regular sites? As for SEO, I like the fact that this theme puts the post title before the blog title. I had to manually change the header.php file on a few blogs of mine that use the blog title first as a default. Of course I’ll get it 😀 I already reserved it – but nobody knows the price yet 🙁 Should come late-July though.